The OLNA enables students to successfully meet the Western Australian Certificate of Education (WACE) requirement of demonstrating a minimum standard of literacy (reading and writing) and numeracy. The standard requires students to demonstrate proficiency in using a range of ACSF Level 3 skills in each component. In Years 10, 11 and 12, students will have up to six opportunities (two per year) to sit the OLNA tests. For students who did not achieve Band 8 or higher in reading, writing and/or numeracy in Year 9 NAPLAN, it is compulsory to sit the tests of the corresponding components in Semester 1 of Year 10, Semester 2 of Year 10 and in Semester 1 of Year 11, unless the proficiency in using a range of ACSF Level 3 skills has been demonstrated (Category 3 on interim reports). After Semester 1 of Year 11, students who have not demonstrated the standard in one or more may, in consultation with their school, choose in which round they will next sit these component's tests. Can students postpone sitting OLNA? Students with a language background other than English or temporary disability, illness or short-term impediment to performance may postpone sitting the OLNA tests. Students who have arrived from overseas, have a language background other than English and have been attending school in Australia for less than one year before the OLNA testing window, must be given the opportunity to sit the OLNA tests to achieve a WACE. These students may choose to defer sitting the OLNA tests until either they have been in Australia for 12 months or have entered mainstream schooling from an Intensive English Centre. Students who are absent or unwell can sit the OLNA tests on another day within the assessment period. Students who are absent for an extended time during the assessment period must sit the OLNA tests in the next round. The Authority recognises that students with a diagnosed disability may require adjustments to the OLNA tests in instances where their disability, impairment, illness or impediment will significantly affect their access to the assessment. Information is available on the Disability adjustments page. Category 1: Students who have not demonstrated the standard i.e. proficiency in using a range of ACSF Level 3 skills in a component. These students have been identified as at risk of not demonstrating some of these skills before the end of year 12 and therefore require specific learning interventions to enable the student to demonstrate the required standard. Individual student feedback identifies some of the skills students have not demonstrated in this component. Category 2: Students who have not yet demonstrated the standard i.e. proficiency in using a range of ACSF Level 3 skills in a component. These students have been identified as at risk of not demonstrating some of these skills and may require specific learning interventions to enable the student to demonstrate the required standard. Individual student feedback identifies some of the skills students have not demonstrated in this component. Category 3: Students who have demonstrated the standard i.e. proficiency in using a range of ACSF Level 3 skills in a component, either through an OLNA test or through their performance in NAPLAN Year 9.The following table provides a quick guide to each category and possible enrolment paths. The following table provides a quick guide to each category and possible enrolment path. 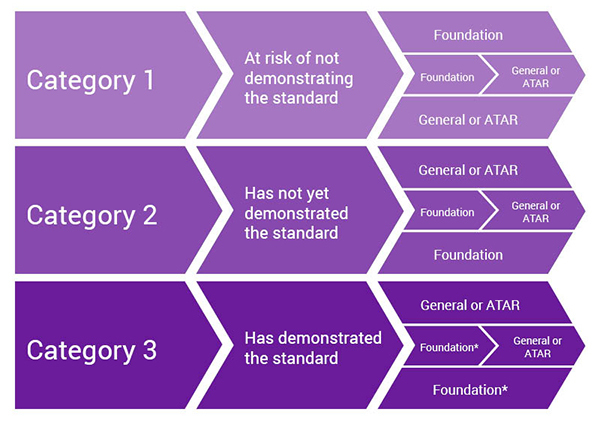 *While students who achieve Category 3 are required to enrol in either General or ATAR courses, exemptions to enrol in or continue to enrol in Foundation courses may be permitted with approval from the Authority. See the WACE manual for details. Foundation courses are designed for students who have not demonstrated the minimum standard in literacy and numeracy. Foundation courses are divided into List A courses and List B courses. Health, Physical and Outdoor Education Foundation. Note: Specific eligibility requirements for List A and List B courses are available through schools, or the WACE Manual. a site with a supervisor approved by the Authority. Home educators are required to negotiate with the school of their choice to identify a suitable date and time. The Authority provides opportunities to sit the OLNA at set dates and times. The Authority’s offices are located at 303 Sevenoaks St, Cannington. Home educated students may sit the OLNA tests at a site other than a school or the Authority’s offices as long as it can be guaranteed that the site has a supervisor approved by the Authority and that travel to the Authority’s offices would be unreasonable. A Supervisor application form must be completed before approval can be considered. All home-educated students must notify the OLNA helpdesk of their arrangements so that access to the OLNA tests can be provided to the relevant approved supervisor. Where home-educated students subsequently enrol in a registered school, and have neither prequalified through their NAPLAN Year 9 performance nor demonstrated the minimum standard of literacy and/or numeracy through the OLNA tests, they must sit the OLNA tests at the first opportunity after their enrolment in the registered school. The Authority provides a range of resources to assist students to develop their literacy and numeracy skills. Contact the OLNA helpdesk at olna@scsa.wa.edu.au or (08) 9273 6726.